In a 52-minute teleconference , Japanese Prime Minister Shinzo Abe and U.S. President Donald Trump agreed to take "further actions" to counter North Korea's intercontinental ballistic missile threat. 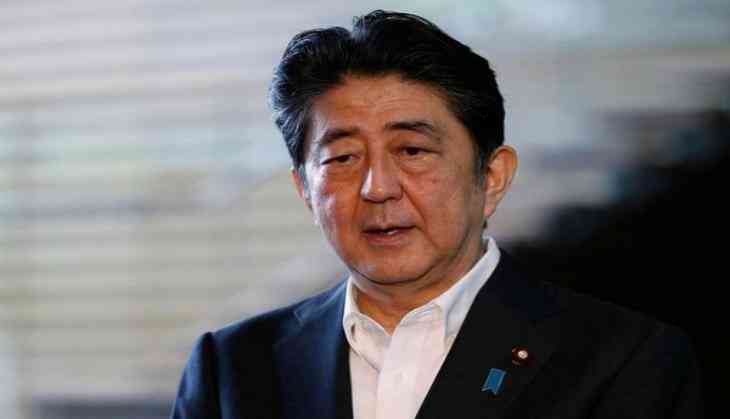 "Under the strong Japan-U.S. bond, we will take concrete actions to enhance our defense capabilities and do all we can to ensure that the public is safe from the North Korean threat," Japan Times quoted Abe, as saying. The teleconference followed the North Korea's second test of an intercontinental ballistic missile that has the potential to hit the "entire U.S. mainland". Japan hosts a number of U.S. military bases and Tokyo fears that it could become an important target for North Korea if a second Korean war break out. Chief Cabinet Secretary Yoshihide Suga said Japan would exhaust "each and every method" to urge countries to fully follow through with economic sanctions against the North as required by U.N. Security Council resolutions. Experts say the U.S. is unlikely to launch a military strike against the North - at least for now - because that would likely spur an unacceptable level of retaliation that would endanger both Koreans and Americans of all types. War would be particularly devastating in densely populated Seoul, which is close to the demilitarized zone. "China accounts for 90 percent of the value of trade by North Korea," Suga said, "China should play a very big role" in putting pressure Pyongyang to halt its missile advances. In response to North Korea's latest missile launch, the U.S. Air Force flew two B-1B bombers accompanied by South Korean and Japanese jet fighters over the Korean Peninsula on Saturday. The U.S. Pacific Command said the mission was in "direct response" to North Korea's "escalatory launch" of intercontinental ballistic missiles July 3 and July 28, reports VOA News. "North Korea remains the most urgent threat to regional stability," said General Terrence O'Shaughnessy, U.S. Pacific Air Forces commander. "Diplomacy remains the lead; however, we have a responsibility to our allies and our nation to showcase our unwavering commitment while planning for the worse-case scenario. If called upon, we are ready to respond with rapid, lethal and overwhelming force at a time and place of our choosing," he added. Meanwhile, President U.S. Donald Trump blasted China for its inaction against North Korea following Pyongyang's latest missile launch.U.S. Ambassador to the United Nations Nikki Haley has urged China to take bolder steps to rein in Pyongyang. "Done talking about North Korea. China is aware they must act. Japan & SKorea must inc pressure," she said in a tweet. Haley then retweeted the link to an article about a joint U.S.-South Korea- Japan military drill that saw bombers and fighter jets soar over the Korean Peninsula on Sunday. Any U.N. resolution "that does not significantly increase the international pressure on North Korea is of no value," she said. "In fact, it is worse than nothing, because it sends the message to the North Korean dictator that the international community is unwilling to seriously challenge him," Haley added.